If you own a truck, it makes sense that you would want to use the vehicle to its full potential. That could mean traveling around the country for work or personal purposes, perhaps a spot of Boondocking? 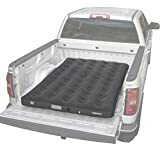 Lots of truck owners decide to purchase a truck air mattress because they are convenient, comfortable and relatively cheap. Plus an inflatable bed for truck purposes can easily be stowed away when not in use. Why would anyone pay for a night in a hotel when they can sleep in the back of their automobile for free with maximum comfort? 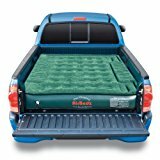 With that in mind, we’ve reviewed some of the most popular truck bed mattresses. Combine with a decent truck bed tent and you have a home from home. Hopefully, the information will assist you in spending your money wisely on only the best truck bed mattress for your vehicle. Below we’ve reviewed 2 Airbedz Truck Mattress options plus one from Rightline Gear which has decent pedigree with truck related camping gear. 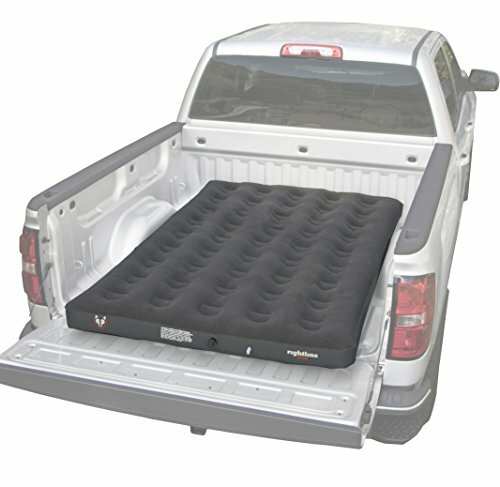 Many people who plan to spend a few nights in their SUV or truck will consider the AirBedz Lite. The product comes in several different sizes to suit almost any vehicle. There are cutouts at the side of the mattress unlike with a standard camping mattress that helps to ensure it fits over the wheel wells in your truck. 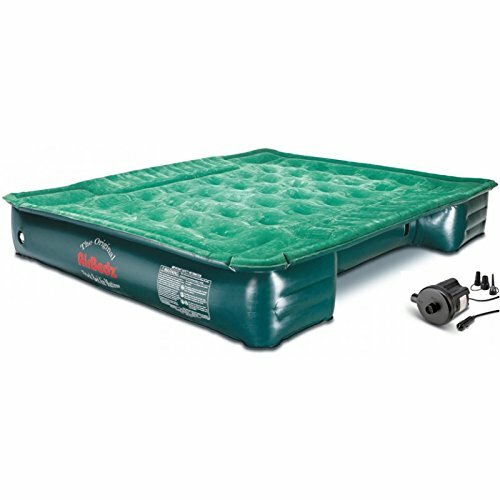 The AirBedz also comes with a portable pump so you can quickly inflate the twelve-inch thick mattress. The only major issue with the design is that you have to keep the tailgate down to use it. If you want to keep your tailgate closed, it’s sensible to look for a different product. It only takes around ten minutes to inflate the mattress and fix it in place. So, it’s perfect for people who haven’t got much time on their hands. Just a couple of minor quibbles with some people claim to wake up in awkward positions because the product doesn’t distribute the air inside evenly. That could become more of a problem for those who plan to sleep on a slope. Buyers also mention that sizes are often slightly out, and some say the dimensions advertised by the manufacturer are not entirely accurate so if you’re buying from Amazon or similar check the reviews. Overall, the AirBedz Lite is an affordable and functional solution that’s ideal for unplanned overnight stays. While there are reports of some comfort problems, they shouldn’t cause too much hassle unless you plan to spend more than a couple of nights using the product. The fact that it fits almost any truck is a significant advantage for motorists. However, the manufacturer would benefit from accurately promoting the correct dimensions of the item. Check out this video from Bob Elgin, it goes on a bit but you’ll get the idea and he explains the installation too. The AirBedz Pro3 is built for adventure according to the manufacturer, and that certainly seems to be the case. Motocross riders and hunters often have to spend unplanned nights sleeping in their truck. So, it’s good that the company tried to design a mattress that provides optimum comfort. Like the AirBedz Lite this product is twelve inches thick which is more than enough to stop you feeling any lumps or bumps of the truck bed. The model also uses luxury fabric rather than flocked PVC. Many people claim they can tell the difference straight away with increased comfort. Like the AirBedz Lite, this design includes cutouts for the wheel wells in your truck. Orders also come complete with a pump that works from your cigarette lighter. So, it’s possible to inflate the product without working too hard. The primary issues with the Pro3 relate to air leaks. Many buyers complain that the product begins to leak air from the moment it’s inflated. That could cause significant problems for anyone who doesn’t place a regular mattress underneath. Also, some people say their item didn’t arrive with cutouts for the wheel wells, and it was impossible to fit it back in the bag after use. For that reason, it’s difficult to recommend this over the Airbedz Lite despite the increased comfort when it is inflated properly. We have to be honest here and say the negative points about the Airbedz Pro3 are slightly worrying. If you’re going to spend a couple of hundred dollars on a truck bed mattress, the last thing you want is for it to deflate during the night. If that happens and you don’t notice, you could wake up cold. Also, it’s important that you can always fit the product back inside its bag. Otherwise, it’s going to become damaged much sooner than it should. Weighing just over 10.4 lbs, the Rightline Gear 110M10 comes in three sizes to suit most trucks. It doesn’t feature cutouts for wheel wells, and instead, the item fits nearly between them. The manufacturers claim that provides side storage space for clothing and other camping gear. Buyers will benefit from a pump, patch kit, and setup guide when opting for this product. Heavy duty PVC should ensure the mattress doesn’t get punctured too easily. However, lots of people have complained about air leaks yet again. Thankfully, the product folds away neatly into its bag without too many issues unlike the Airbedz Pro. After sleeping on the mattress for a couple of hours, it can deflate to almost 50%. That is a major problem for people who plan to use it often. It’s virtually impossible to stay comfortable when that happens because you will feel the truck bed underneath. Especially if you’re a side sleeper. Most leaks tend to occur from the valve, and so it’s not a puncture-related issue. That means the patch kit isn’t going to make much difference to anyone. However, the price is much lower than other items mentioned on this page. So, it all comes down to how you plan to use the product and how much you can afford to spend. All in all, there are much better products on the market compared to the Rightline Gear 110M10. Nobody who buys a truck mattress wants it to deflate before they’ve had time to fall asleep. That fact alone makes this product unfit for purpose, and it’s no wonder the item gets consistently bad reviews online. Sure, it’s affordable, and so some people might want to take the risk. However, if money isn’t your deciding factor, look elsewhere. 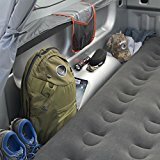 Which is the Best Truck Bed Mattress of these 3? So, now we have to compare the three truck bed air mattress options in the hope of declaring a clear winner. You can probably gather that the Rightline Gear 110M10 comes in at last place. A deflated mattress is like a chocolate kettle – utterly pointless. It’s hard to work out why the manufacturer doesn’t switch to better valves. That said, you could probably change the valve yourself if you wanted to get something cheap and improve it. Still, that seems like too much hard work. Our winner today is the AirBedz Lite because it’s a mid-range product that doesn’t leak often. Sure, the advertised sizes aren’t always accurate. However, they’re usually slightly on the small side rather than too big. That means you can still use the mattress to get a decent night’s sleep in your truck. Also, orders come complete with a pump that can inflate the product in less than ten minutes. 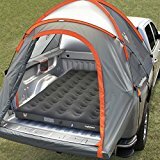 So, it’s ideal for anyone who just needs an inflatable bed for truck camping that’s reliable and isn’t going to require too much time or effort.